So they "split" the search Radar unit into smaller one like in Throphy. That's good.. in previous Arena i see the centralized station is in risk of disabled by small arms fire.. which can lead to loss of function. The fixed MMW radar elements could be made bullet resistent. So Drozd = Blackbird and was tested in Afghanistan in the 1980s on the T-55AD. 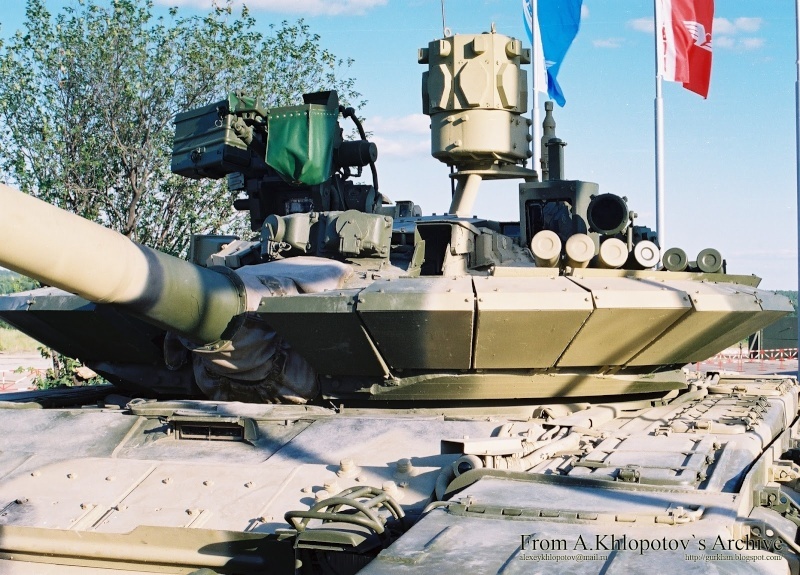 The APS for T-95 is called "Standard", and the APS system for T-99 Armata is called "Afghanistan". Other Soviet systems I have heard of include Rain, Shater, Barrier, and Arena and Drozd-2. Looking at the new design the interception modules have been moved to four bins located around the turret... I rather suspect it should be able to handle multiple layers of munitions and would also be easier to reload than the old arrangement of munitions around the turret where fragments and small arms fire could damage them. Equally the radar components are much smaller and likely more sophisticated and capable, while still offering full coverage. The question of course is will they call it Arena 2 or just Arena because the first model did not get beyond tests. The interesting thing is that Drozd, which preceeded Arena also had similar smaller MMW radar detection "boxes" around the turret, and the main change with Drozd 2 is it has larger heavier interception rockets that cover a wider angle. So they have basically changed the large tower with MMW radar sensors to six small radar boxes on the turret with two forward, two back and two pointing sideways. They have also removed the munitions from around the front edge of the turret to what appear to be four protected munition bins with two up relatively high to the rear and two mounted low where the turret front ERA ends. In the pictures I have added to above the Blue Xs are the munitions bins, the Red Xs are MMW radar sensors, and the light blue small x shows the optical sensor that is part of Shtora (ie laser and IR sensor) for clarity. Note I posted the original photos in case the big Xs made it hard to see clearly. So they have changed the arrangement of the system... the question remains if the performance has also changed. I would expect the radar technology has improved a lot, and the computer boxes inside the vehicle are much smaller, and perhaps better integrated into other systems like Shtora. Questions I have include why are the munitions bins so tall... is it to allow extra layers of munitions to be loaded? And of course can it deal with top attack weapons yet? Obviously the greatest threat on the battlefield is RPG and RPG like weapons... simple and widely deployed, and therefore a common threat that is worth dealing with. Good Post Garry my vote. I think the current system is more modular and more resistance to complete failure and replacement should be easy depending which module gets damaged. I prefer the old tower system. The higher the elevation the better the observation. A plug-in tower is more compact making it easier to remove and less likely to be damaged in a LOS attack. One hit might knock it out, but you can fix it far easier by plugging in a new tower than replacing damaged components that will likely have severed connections running around the surface of the hull. I think this is perhaps for updating older models and I hope for the next gen of vehicles they have integrated Shtora, APS (Afghanistan), as well as the anti sniper laser optics system and anti sniper audio system together, so instead of a set of 6 MMW radar boxes around the turret that they integrate MMW radar and optics/IR/Laser and audio sensors. I think the tower would be hard to camouflage, but could be designed to fold down if it was in addition to a turret based arrangement. Obviously when moving the vehicle is less vulnerable to RPG attack, but I think that having both sensor arrangements might have some merit. As Vlad points out the tower offers a better view, and adding other smaller more compact sensors could make it even more useful. In fact if they redesigned it so that they had the 6 radar antenna only up on the tower and the electronics in an armoured box at the base the tower could be much more compact and harder to damage. Especially if the connections are very thin fibre optic cables. I rather suspect the tower idea was rejected because it is large and blocks the view of the new commanders panoramic sight and RWS gun arrangement. A smaller head on the tower is another way to fix this too. Perhaps the munitions boxes are better armoured now? I don't know if it was ever considered a serious problem but I would imagine that they would be vulnerable to even small-arms fire. From the electronic point of view you cannot have "extended" sensor suit from signal processing module. Radar systems are not like radios where you can have extended antena receiver and then lead the signal to the main unit via copper. In a MMW spectrum you ant to have signal processing unit as close to the transceiver as possible in order to minimize signal distortions. However having defence management unit separated and placed inside the hull is quite logical and very likely. Each of the MMW small radar unit having its controller can report to the main defense management using either wired or wireless connection and as Garry pointed out fibers today are quite small, very fast, resistive to electronic interference and generally very reliable in outside enviroments. So using fibers would be very logical option. Regarding the new overall look of the Arena - i think the main purpose why they removed the big radar tower was to make the system less "noticable". When potential enemy strategist will look onto satelite images or UAV material they are less likely to notice this new Arena version - to be honest if it were not for the X's on the images it would take me a lot longer to notice those components. And here we have images of a model from very close distance. You can pretty much imagine Satellite images or UAV. When big changes make big difference it is ok.... when small changes makes big difference, it is outstanding. So the relative small size of the system might cause that the overall capabilities of the tank might be greatly underestimated, and this is probably one of the main goals. The ammo containers might be tall because there might be more vertically loaded ammunitions or single munition unit might have taller profile in order to "jump" higher and trigger a blast to disable top attack missile. As i know no missile have a 90 degrees descent upon targeted tank. They are all comming down in a like arround 60 degrees angle. This is well enough for a system like Arena to disable such attack. Oh and by the way the second image from the top looks like Drozd APS. Anyway while the new system might look less "mean" it might be much more capable. Lets see - do you have any info about the anti-sniper systems. I have seen hand held ones also bearing detectors based on sound profile but they were all either handheld or experimental systems. I posted a thread on here about the binocular based system, which is a new development of an older system called PAPV from memory that weighed about 30kgs. The new binocular anti optics system is fully operational and has already been used to protect Hugo Chavez at least once. If they can fit the electronics into a pair of binoculars they can certainly fit them into the system like Shtora or Arena. On another thread Mindstorm translated a part from Gur Khans blog where he stated the new APS system for Kurganets-25 can stop APFSDS rounds, which I presume is the system called Afghanistan being developed for armata et al. Not only were the original munitions of ARENA not armoured they were spread around the entire lower lip of the turret making the vulnerable to damage. Moving them to armoured boxes should make them safer and potentially make reloading quicker and easier. I would assume in high threat areas larger bins with more munitions could be fitted, both to the turret and perhaps the hull for a long stay dug in, say in a fire base. I remember seeing an article some time back about a Ukrainian APS (I don't remember the specific system) test on a 125mm APFSDS round. It didn't completely destroy the penetrator but hit it hard enough to cause it to impact the armor at an angle, thus diverting the energy enough so that the round didn't breach the target. 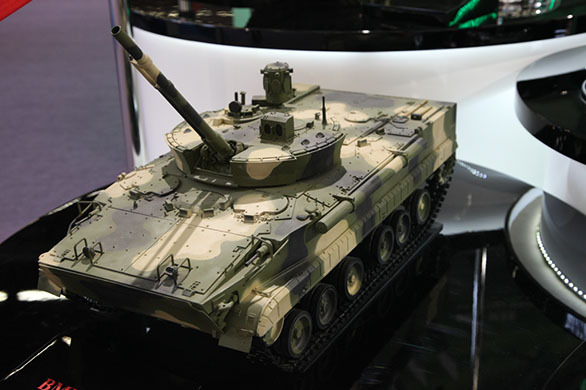 I doubt an IFV will have enough armor to stop the crippled penetrator though, it might be able to save an Armata from an otherwise lethal hit to the flank. Anyways, I find it amazing that they even have the capability to catch the "silver bullet". Imagine how surprised that commander would be when he gets a solid hit on an Armata's side and his gunner says "That one bounced!". You hit on an important point Zivo... just because a vehicle has an APS system it doesn't mean it will work perfectly every time, nor is there a guarantee it will be 100% successful either. Quite often RPGs miss, or hit at a bad angle and don't penetrate as much armour as it says on the box. Well today using MMW you can have very fast point precision, i would even go as far as to say they could design a "kinetic kill" APS. But ARENA isn't one as such... i think the problem with westerns APS like Iron Fist is that they did not take into account the possibility that a weapon can be fired onto a vehicle in salvo mode. Meaning 2 and more missiles approaching. In this case ARENA have a much higher success of disabling them all as it is area effect defensive system, not a point precision one. On the other hand however it has a drawback that it cannot be used in the vicitiny of friendly infantry units as it might injure friendly soldiers. But then again it might be perfectly used against ambush. And again to compensate this, i think it will hardly have much effect on APFSDS rounds - but i might be wrong. Depends on the explosive force. But i think that against APFSDS rounds the kinetic kill system would be the best bebcause the chance of diverting the penetrator from its original trajectory, in order to cause it to hit a angeled armour and ricochet is the most highest. I believe that your doubt come from the fact that very few persons have the capability to clearly picture in theris minds how much residual penetrative potential retain an highly destabilized APFSDS's rod : barely sufficient at scratch a modern armour . Interesting video, but there are some points worth discussing in detail. At 3:04, there are two clips simultaneously shown. The clip on top consists of 8 frames and shows a kinetic energy penetrator traveling in a strait path with an upward angle of attack of approximately 45 degrees with zero visible rotation occurring. The clip on the bottom consists of 7 frames and shows a KE penetrator traveling in a strait path with a 45 degree downward angle of attack with perhaps 5-10 degrees of rotation visible over the length of the clip. Neither video shows the actual interceptions. Due to the lack of significant rotation occurring in the frames, it can be concluded the rounds had to travel some distance after interception to reach the 45 degree angles shown in the clips, far beyond Iron Fist's usual protective envelope. The other clip that relates to KE penetrator interception starts at 3:00 and shows the actual Iron Fist round hitting and presumably completely destroying the KE penetrator mid flight. However, it should be noted that the interception point is clearly preplanned, as indicated by the black (+) on the concrete barrier in the background. Keep in mind these tests are all done in a controlled environment. It would be nice if someone could a least find a video of some of the full tests on KE rounds. Ultimately, this video does not show the successful interception and destruction of an APFSDS, but shows a successful advertising campaign. Currently, there is no known APS that can track and engage a KE penetrator. Which is understandable as it's hard enough just to stop a Kornet traveling at ~600m/s, by comparison a APFSDS travels at 1500-1900m/s. I got my fingers crossed for the Afghanistan/ARENA 2 APS. Regarding the damage, IMO intercepting and disrupting an APFSDS 45 degrees or completely destroying it outside a controlled environment is a near impossible feat, and this is the absolute BEST case scenario for reducing an APFSDS penetration. The big question is, with a realistically achievable 10-20 degrees of disruption, will a APFSDS penetrate an IFV from the frontal arc? Iron fist is a single turret with two launch tubes? What happens when you face a real enemy like the Tiger based Kornet? It can fire two missiles from each launcher at a target, so with two launchers that means it can fire and control 4 missiles... if it spots a Merkava from say 6km range and first launches two missiles from one launcher and then waits 20-30 seconds and then fires two missiles from the other launcher what exactly is Trophy going to do about it? Regarding the APFSDS spin... that might be a fin induced slow rate of spin to ensure the Sabot separates cleanly... when it gets hit by the blast from an interceptor it would rapidly lose that rotation inertia. On the subject of APFSDS rounds they are like needles... they will puncture your skin very easily using the point, but sideways would be useless except against soft targets. The big question is, with a realistically achievable 10-20 degrees of disruption, will a APFSDS penetrate an IFV from the frontal arc? Hitting point on, the entire weight of the length of the projectile is concentrated on the point of the penetrator. Change the angle by a few degrees and instead of a penetrating force, it becomes a shearing force that will snap the penetrator and likely shatter it. I think that is not wise and even less useful attempt to twist empiric observation to cause it to meet a pre-existing hypothesis. Neither video shows the actual interceptions. Due to the lack of significant rotation occurring in the frames, it can be concluded the rounds had to travel some distance after interception to reach the 45 degree angles shown in the clips, far beyond Iron Fist's usual protective envelope. 1) Significant reduction in rotation (admited that is was even visible on the compressed frames shown....) is a forced occurrence for any highly destabilized KE rod ,is sufficient to observe almost absent residual KE penetrator's gun induced rotation after ricochets (and here we talk of energy's order of magnitude several times greater than that involved in penetrating rod ricochets ). 2) I have the strange feeling that your strange deduction on the "virtual" range where the interception of the KE projectile happened is fruit of an easy misconception : very likely you have infered that an APFSDS with a speed at the gun's exit of 1500-1600 m/s would require a great amount of space to achieve similar type of AoA variation ; instead those type of explosive-generated ,yaw-forces-induced rod's destabilizations happen usually in time frames in the order of microseconds and spaces in the order of few cm (it is the rule for any oblique plates to penetrating rod's interactions in heavy ERA modules -all in 6-7 cm ! !- or in new type of APS such as the Czech Explosively Formed Axem -EFA-). Currently, there is no known APS that can track and engage a KE penetrator. One more time : where come from this phantasy notion ? Those days almost any modern APS show sensor and data processing capabilities to achieve a fire solution on offensive elements with virtual speed multiple times greater than today APFSDS shoot from 1500-2000 m. (the interception of an RPG shoot at 30 m require a much greater sensor responsiveness and data processing's speed than a tipical MBT APFSDS shoot) and the interceptors of almost all of them is capable to generate the energy necessary to reduce the residual penetrating potential of the most modern KE projectile to ridiculous levels. The unique real problem with APS is COST , material and human - both for production and mantainement/logistic - , up to those days not considered enough profitable, in the balance with catastrophic menace event's probability , for order theirs mass induction on MBT and LAV , simple like that. Yes ,usually is possible to mount an interceptor launcher on each of the two side of the LAV vehicles (or up to three in total on MBTs, two on the sides and another in the turret's center). Against a concentrated attack with new the authomatic guided salvo capable Kornet-EM it would be obviously saturated but is important to point out that against several other ATGM ,in partiucular those with top-attack profiles (against which its interceptor numebers would be the double) or requiring active optical/TV guidance by part of the shooter and therefore uncapable of salvo attacks (such as the Israeli Spike-LR ) Iron-Fist would remain very efficient. 1) Significant reduction in rotation (admited that is was even visible on the compressed frames shown....) is a forced occurrence for any highly destabilized KE rod ,is sufficient to observe almost absent residual KE penetrator's gun induced rotation after ricochets (and here we talk of energy's order of magnitude several times greater than that involved in penetrating rod ricochets . The problem with these 15 frames is that it does not prove that Iron Fist, or any other APS that works on similar principles can actually track and intercept a KE penetrator. What is shown is a destabilized KE penetrator flying at an extreme AOA, and the lack of damage it caused to the target in two still frames afterwards. Using the ~1.5ft KE penetrator as a scale, the distance the round travels ON camera is ~10ft. During those 10 ft, it rotates ~5-10 degrees. To reach the 45 degree AOA shown, it would take ~45-90ft respectively from the point it was initially destabilized to the point it hits the target. APS do not intercept rounds at anywhere near that distance. IMO, they either mounted Iron Fist far in front of the target off camera, or placed an HE charge with an electronic timer on the path of the KE round and detonated it as the round passed over simply to demonstrate how ineffective a destabilized KE penetrator is. I think the guys in post processing were rather liberal with their narration. Rafael also did a KE projectile demonstration, and they achieve a similar 10 degree AOA change over a 10ft distance, just as I estimated in the Iron Fist test. (See 1:31-1:37) https://youtu.be/62jzAupr044 Hopefully now you can see why I'm skeptical of IMI's test of their system at intercepting KE penetrators. Unfortunately from the Aspro-A test clip, it's impossible to tell if it was a true intercept or just a timed HE charge, at least in this we get to see the explosion. Rafael even says Aspro-A is in "advanced development against kinetic energy projectiles", which sounds like they mean in the near future it may be possible to intercept them. instead those type of explosive-generated ,yaw-forces-induced rod's destabilizations happen usually in time frames in the order of microseconds and spaces in the order of few cm (it is the rule for any oblique plates to penetrating rod's interactions in heavy ERA modules -all in 6-7 cm !! Apples and oranges. 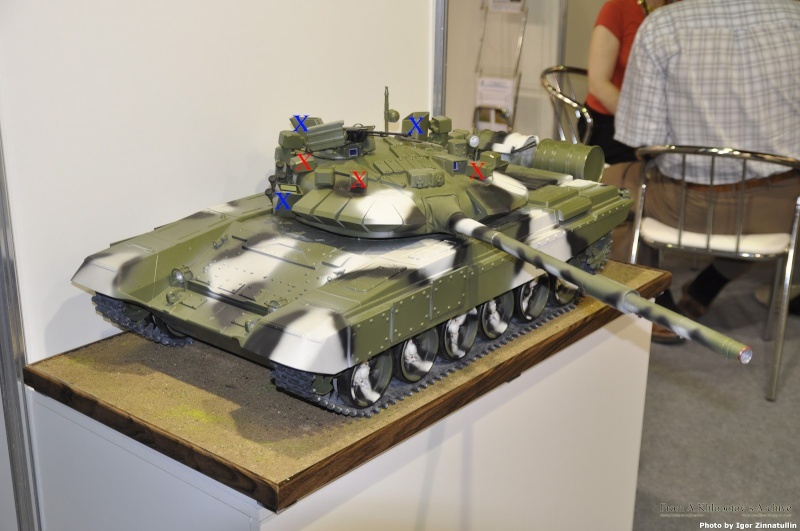 ERA and Active Protection Systems such as Aspro-A,ARENA,Iron Fist etc. work on completely different principles. Thanks, I was trying to remember what that system was called. EFA, at least the heavy version does look promising at stopping KE projectiles. I mentioned it earlier, I guess it's Czech, not Ukrainian. But it is configured and operates much differently that the previously mentioned APS, it uses a rather large shaped charge to shatter the penetrator and a very narrow, highly precise sensor area to trigger it. The problem with it is that it doesn't have the coverage ARENA, Aspro-A, and Iron Fist offer. A combination of the systems in a multi-layered defensive suite would be best. Sensor speed is just one element in the whole process of intercepting an incoming projectile. Even if you detect it, you still have to target it and destroy it, that's were I find systems configured like Aspro-A, ARENA, and Iron Fist to be lacking. Find a video showing an interception of a KE penetrator similar to the RPG interception demonstration at the one minute mark of the Aspro-A video, that would definitely convince me it's possible to reliably defeat a KE round with this generation of APS. I like Show and Tell, but I get tired of all the tell and not enough show. If their APS can launch a projectile and destroy a KE round, why not film the process, why all the cropping and cutting? Please Zino stop yourself now ,in your totally artificial doubt's spiral and absurd Don Quixote fight against the ,by now, well known and accepted achievements in this field by part of dozen of different scientific institutes around the globe and production companies your thesis become more and more fractured from reality. Obviously the great part of the over axis AOA variation of a KE rod disturbed by an explosive charge in the class of Iron Fist happen in the fraction of second of its detonation ,after the penetrator continue near its existing inertial direction's vector at reduced speed and significantly reduced pace of AOA's variation until its impact with the LAV armour. Rafael also did a KE projectile demonstration, and they achieve a similar 10 degree AOA change over a 10ft distance, just as I estimated in the Iron Fist test. (See 1:31-1:37) https://youtu.be/62jzAupr044 Hopefully now you can see why I'm skeptical of IMI's test of their system at intercepting KE penetrators. Hopefully you can see how the same video you posted ,if that was even necessary ,reinforce even further what said in mine previous intervention. Just in this video ,in fact is possible to see that, in spite of the very limited mass and the related tangential force exerted by those Trophy's intercepting elements ,the rod begin to lose nose stability at 1:33-1:34 and at end of 1.35 and 1:36 (in correspondence of the word "seen" and the target element in the background) exit ,to the right, from camera field of view with an AOA enormously changed . And i repeat ,here we talk of a type of APS which like old Arena ,for the defeating mechanism used in the interception, shouldn't have, virtually, any chance to destabilize a MBT's APFSDS round !!! Even if you detect it, you still have to target it and destroy it, that's were I find systems configured like Aspro-A, ARENA, and Iron Fist to be lacking. Aspro-A and Arena, contrarily to Iron First, should have very limited capabilities to defeat an incoming KE projectile for the type of active element used in the interception , naturally theirs advantage is that, to the contrary of Iron Fist, them can intercept a greater number of menaces for aspect before becoming exausted. During those 10 ft, it rotates ~5-10 degrees. To reach the 45 degree AOA shown, it would take ~45-90ft respectively from the point it was initially destabilized to the point it hits the target. APS do not intercept rounds at anywhere near that distance. Angled armour has two effects... it increases the actual thickness of the armour the projectile needs to penetrate by angling the path so instead of crossing the street at 90 degrees from the footpath, you end up jay walking at an angle and have to cover a lot more "road" to get across. The other effect is that at shallow angles the penetrator can sometimes skip off like a pebble on a lake. The thing is that only full calibre penetrators will ricochet. A long slim dart like penetrator will gouge a trough and still try to penetrate. The thing is however... if that dart like penetrator is not flying like a dart... if it hits at a sideways angle the tip wont get the push from behind it would get if it hit properly. The energy will be wasted, the tip will likely shear off and the shattered pieces of the penetrator will not penetrate. The problem with these 15 frames is that it does not prove that Iron Fist, or any other APS that works on similar principles can actually track and intercept a KE penetrator. I would say the opposite... the frames clearly show the APFSDS round being effected by the system, which means it not only tracked the incoming projectile but also managed to send out the interceptor rocket which detonated at the exact right place and time to disrupt the incoming projectile. Radar signals travel at the speed of light which is plenty fast enough to go out and hit the incoming projectile and then return, be analysed, identified as a threat intercept path calculated turret aimed and fired. I would suggest Arena would be better in its original form as it doesn't need to aim to fire its interception munition, and launching its munition up to fire fragments down in the path of the incoming threat it minimises the danger of nearby friendly forces because all the fragments end up in the ground. ARENA was never designed to defeat APFSDS rounds, its design was to engage AT rockets and missiles on the battlefield, which in my opinion it should be perfectly capable of dealing with. It could already deal with top attack missiles like BILL and BILL 2, and for diving top attack weapons I personally think DIRCMs would be more efficient and effective, while Nakidka should deal with MMW radar guided top attack Hellfire and Brimstone. As much as I appreciate your criticism, you still cannot present a video showing the tracking, interception, and defeat of a KE projectile. These manufacturers have proven multiple times on video, from multiple angles, that their systems are capable of defeating RPGs and ATGMs, both inside and outside a lab. This is an old trick that has been repeated ad nauseam, there is no dispute about this proven capability. What they haven't shown is that their systems can reliably defeat an APFSDS, and they don't have to, as they don't make that claim. They show through a series of clips that there are certain elements of their system that exhibit anti-APFSDS potential, but do not say their Active Protection System as a whole, can defeat a KE round, only that they have tested their systems against them. If you want to interpret the test clips as confirmation that the APS is capable of intercepting and defeating APSFDS and claim it as fact, be my guest. In my opinion it would be incorrect to draw any conclusion about a system's capabilities based on these videos as we do not know the context, the objectives, how many variables had to be removed and how many times the process had to be repeated to get the results shown in these select tests. I guess I'm just more skeptical than you, and I'm not convinced that the clips demonstrate true anti-APFSDS capability. I have found two manufacturers that specifically claim to have an APS with anti-APFSDS capabilities. SAAB, says there is an upgrade in development for their LEDS-150 that can defeat KE penetrators. SAAB's publications do not list APFSDS as a round the current version of LEDS-150 protects against, and makes no hint at KE protection. The other company is Explosia, with their EFA, and only when it is applied as an additional layer of protection to the glacis of an MBT, which has already been mentioned. Agreed, the physics are all there. If a system can destabilize a APFSDS, it should offer a significant increase in protection against them. No current APS was designed with the intent of defeating APFSDS. EFA could be the exception, but even that was focused more around removing the threat of the Explosively Formed Penetrators showing up in the hands of guerrilla fighters. The reason designers looked passed the KE threat is because, by far the largest killers of vehicles are not APFSDS, but RPGs and ATGMs. The VDV demand for an anti-KE APS seems to be one of the best uses of a system. It would actually give their BMD's a fighting chance against armor. Regarding DIRCMs, they are already in service with the VVS on the President-S countermeasure suite. If the money is there, DIRCMs will probably be incorporated into Armata, Boomerang, etc. 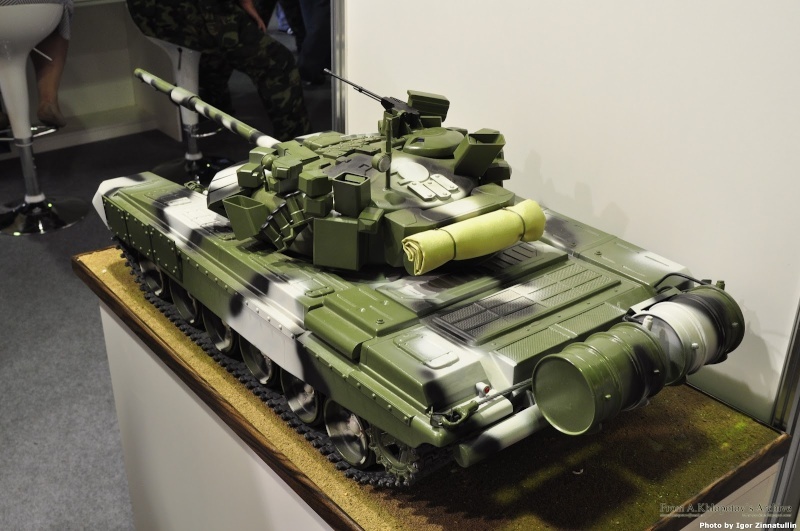 The goal of the Russian designers is to produce a modular and scalable defensive suite consisting of passive, detection, softkill, and hardkill systems. Then deploy the system across multiple platforms for a reasonable price. I'm sure over the next year or two, we will get to see a lot of these pieces coming together. Don't think of an APFSDS round as some super thing. The kinetic forces involved are enormous. Have you ever used a hammer to hammer in nails? Anyone knows that it is critical to get it straight and to hit it at the perfect angle. Imagine if the hammer was hitting that nail at over 1km per second... more than three times the speed of sound. If it is flying straight it will penetrate even the steepest angle of armour plate. I have seen a photo where an APFSDS round has hit the roof of a tank at such a shallow angle there is a groove or trough of about 1m in length where the penetrator grazed the roof, and then it hit a raised part near the cuppola and it punched a neat hole where the armour was angled upwards. When it hits and is stable then no angle of armour will deflect it when it is flying point forward. If however it is not flying point forward it will snap like a twig and shatter when it hits the armour because the weight and energy is not concentrated uniformly on the tip of the penetrator so it has no penetration potential. Hitting side on means it will have very little penetration performance because the energy is spread out and it doesn't have 4-7kgs of penetrator mass driving it forward. New penetrators often have multiple penetrators designed into the penetrator so if the front tip is cut off through ERA action then a follow up shaped tip can continue the penetration. Such a structure when destabilised and hitting at an angle of even just 10 degrees will cause the penetrators to shatter and separate... just like a nail would bend and flatten itself against the wood you are nailing. This version should be more appealing towards customers vs the older towered ARENA system. Mainly because it is much easier to integrate on any vehicle and doesn't require the cassettes to be placed in a ring completely encircling the turret. The new cassette system is also simplistic in its design with very few moving parts, vs some of the other independently aimed APS on the market. The main problem is it still cannot defeat steep diving munitions which are becoming more numerous on the battlefield. Independently aimed APS should have no problem in doing so. Another problem this system may have is weight, it has a lot of large components on it, that might limit the types of vehicles it can be used on. Despite some possible issues, this upgrade should make ARENA a competitive system, in its previous version it certainly wasn't. I really don't think we know enough about the changes to the system to comment fairly. With the old system there was pretty much an array of munitions that faced in a circle around the front of the turret. The fact that the munitions were side by side and faced outwards... each covering about 5 degrees or so, but presumably each munition that was launched up and directed its fragments to intercept the incoming threat actually covered a wider area than it was directed to, so that a threat launched from the same direction with the turret remaining pointed in the same direction and the vehicle stationary too, meant that several munitions could cover that single angle because the spray of fragments they generated overlapped by quite a margin. With four launcher bins in the new model... do we assume that each munition covers an entire quadrant? The shape of the bins suggests to me that some munitions could be fired at a lower angle to intercept further from the vehicle while others could be thrown upwards in a more vertical path. The point is that they have decided to change the storage of the munitions to protected bins and to move the MMW sensors to separate locations around the turret... did they also take the time to redesign the munitions so that they could direct fragments upwards?